This container booth was used by Hoerbiger Holding AG to present its products at the DIAM (German Trade Fair for Industrial Fittings) 2017. 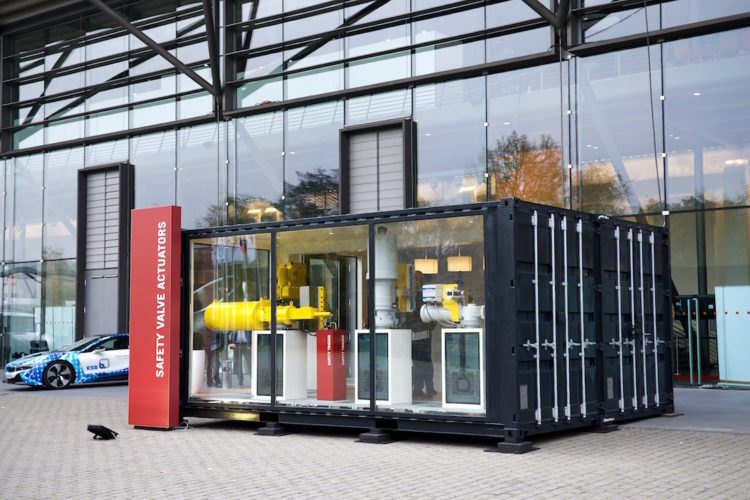 The exhibition container was placed well visible at the entrance to the fair outdoors and generally accessible to the public. The temporary container building consisted of two 20 foot high cube containers. Both containers were placed side by side and the longitudinal walls between the two containers were removed. One container longitudinal wall and the two end faces with door opening were preserved. The two closed end faces and the remaining longitudinal wall were removed and replaced by glazing. The containers were supported via steel plates. The trade fair appearance of Hoerbiger Holding AG was conceived on behalf of the Graustich agency.